After a hard day’s work one would want to forget about everything else and relax. A walk in the park or some quiet time under the trees sounds great provided there’s a garden or park close by. What if there isn’t one where you live? Well, why not create your very own garden on your terrace? You can potter around among the plants, enjoy the morning sun with a cup of coffee or the evening breeze after work. Invite your friends over and have a terrace party! A terrace garden needs planning to the very smallest detail. It should be well designed and proportionate with flowering plants, shrubs, small trees, a lawn, and a water feature, a rock garden or a gazebo. The latter serves as a cool and shady section of your terrace. The first thing you need to do is make sure that the roof which will hold your garden is strong enough to support the weight of the garden. It should be leak proof and have a slight slope for drainage. Place burnt bricks of 2” by 4” evenly on the terrace. An alternative to bricks is corrugated sheets that should be placed at a distance of 3 feet to allow the water to flow into the drain. A wire mesh net should be spread over the bricks so the soil does not seep between the bricks. If your terrace is larger than 500 sq.ft, several drain outlets that are connected to the terrace’s drains can be constructed. Just make sure they are all artfully concealed beneath the lawn. The ideal soil is peat moss or soil rite mixed with garden soil and manure as it will not exert pressure on the structure. Plants with fibrous roots are better than those with tap roots as fibrous roots will not grow through the building. 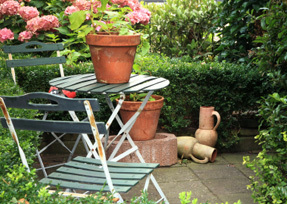 Select plants that bloom in different seasons so that your terrace looks colorful all through the year. Fill the pots or containers with the soil mixture, the mulch and sow the seeds of the desired plants. Wait and watch them grow and bloom. Be sure to place taller plants behind shorter plants so that all of them get adequate sunlight. Arrange plants with contrasting colored blooms and interesting textures in groups to enhance the visual appeal. Self-contained water features or a gazebo can be the focal point of a terrace garden. And voila, your very own garden in the middle of a concrete jungle!